I hope everyone will be tuning in to the 85th Academy Awards today at 7 pm EST. 2) Using a spoon, stir eggs with sugar and vanilla; add butter. 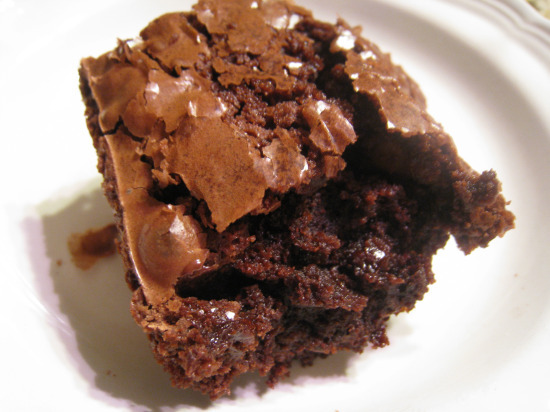 3) Sift GHIRARDELLI GROUND CHOCOLATE with flour, baking powder and salt. 4) Stir into egg mixture; add nuts. 5) Spread into greased 8 inch square pan. In heavy saucepan on low heat, melt broken chocolate with butter, stirring constantly. Beat sugar with milk, vanilla, and salt until smooth. Add melted chocolate, and beat until thick enough to spread on cake. These brownies are good. Really, really, really good. When I loved in my old house, my neighbors would come over and watch the red carpet and we would just devour these. They are a great addition to any party, or for yourself if you’re hosting your own solo Oscar party! Hopefully I will be able to concoct a vegan version of these in the near future, but for now – these are reserved for my non-vegan readers!